The Control Panel is designed to adapt to various configurations to house the necessary components and fulfill the control function for Temperature, Humidity and Light. Inbuilt intelligence ensures safe, long term operation. The SP Scientific Control Panel is designed and manufactured to be as versatile as possible. The standard housing can accommodate all the components needed to control all the parameters that may be required in the room. Options include chart recorders, data logging controllers, touch screen plc controllers and custom contol and indication devices that customers may specify. The Control Panel is also capable of being mounted remotely when space is at a premium, on the front of the room by the door, or on any of the rooms external surfaces. Each configuration is specified in the design stage, so that all the necessary changes can be made at inception, so that the final installation is seamless. By incorporating the latest technology in control electronics and systems, SP Scientific is able to show significant efficiency gains, which is good for the user and good for the environment. This technology also allows SP Scientific to incorporate sophisticated safety systems to protect the room, the contents and the users from damage or injury due to external malfunctions or disruptions so you can stay in control of your tests and experiments. Honeywell Chart Recorder. Either single pen or 2-pen options to chart temperature and/or humidity over 24 hours or 7 days. Ease of use. The control panel is mounted at eye-level to make setting and reading parameters easy. Setting conditions and Hi/Lo limits is a simple operation using push buttons until the LED display reads the desired amount. Versatility. 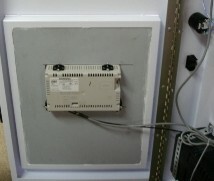 The panel can be mounted adjacent to the door, on any outside room panel or remotely. It can also accommodate all the components to operate from a single set point requirement to a complex parameter cycling regime. Data logging. An optional datalogging controller is available to maintain records of conditions over time. Computer interface. Connection to a PC through a serial interface (RS232) enables transfer of data. User defined alarms. An independent alarm can be set for each parameter value. The alarm settings are stored in the controller and automatically applied if the conditions stray from the set values. Performance and Accuracy Using a PLC System with PID Control. Environmental rooms are available with a PID control system (Proportional Integral Derivative) or PLC with touch screen menu driven software. Once environmental conditions are set the control system uses the PID algorithm to maintain the programmed room conditions and minimize over shoot. The digital control system maintains 0.10C controller resolution through the entire temperature range and proportions power to the heating system upon demand for rapid recovery. There are no mechanical cycling relays, solenoids, and/or contactors. Zero cross-stitching eliminates radio frequency interference. When used with a wall plenum, there is a temperature uniformity of 0.3 C. Programmable ramping and soaking controllers are also available. Relative humidity is controlled through PID or by the digital PLC control system. This touch screen system allows you to set in % RH. Relative humidity is detected by an electronic dry sensor that provides control of 2.0% over the entire range. All SP Scientific high and low limit electronic controls are independently circuited with audible and visual alarms. In the event of a control malfunction, a high limit system stops power to the heaters and humidifier while maintaining conditions at slightly elevated temperatures. The low limit system reacts by turning off the refrigeration system while maintaining a slightly lower operating temperature. An independent dry set of contacts are provided for connection to the users Building Management System.